There are currently 250 children living on Katsikas camp, and we expect this number to double as extensions to the camp are completed this month, which will increase the capacity of the camp to from 500 to around 1,000. There is no formal education at Katsikas camp, so our volunteers take any opportunity to help the children with some informal education. This week, this included helping the children with their ABCs, but previous fun has previously included dance and martial arts lessons. Collectively, our volunteers are skilled in many areas, and they run a number of different education and fun activities on camp to help keep residents active. We always encourage volunteers to bring their ideas and creativity to camp to help us aid refugees and bring some normality back to their lives. As summer draws to a close, we are looking for volunteers to join us over the winter months to aid refugees. If you’d like to volunteer in a refugee camp this winter and help refugees, please contact us today and read our volunteer stories to see what volunteering with Refugee Support is like. Last week, we shared some updates about our new empowerment fund, and it’s been fantastic to witness and growth of some of these individual projects so far. As well as the good news of an extended menu at Café Yasmin – Katsikas camp’s cafeteria, run by residents – another beneficiary of the empowerment fund shared good news this week. With the financial aid of the empowerment fund, Mamdooh – a young Palestinian businessman living at Katsikas – has created a range of perfumes which we expect to see sell out rapidly. Mamdooh’s wish is to build his business so he can start employing other people living on the camp, and we expect to see this business take off swiftly as we continue to support him as he grows the business. We’ve had great feedback and a response to the empowerment fund. We hope this project can continue to benefit camp residents and make them feel more in control of their lives. If you or someone you know would like to aid refugees in Greece by donating to this project, please donate today. No amount is too small and ALL donations go to refugees. We were sad to hear more news of migrant death’s off the coast of Libya. 100 migrants drowned earlier this month as a vessel sank after Italy opted not to dispatch a safety ship to aid. Over 1,500 migrants have died while attempting to cross the Mediterranean so far this year. This just illustrates the dangerous measures that migrant families are feeling forced to take to seek safety. We also recommend reading Khaleed Hosseini’s new illustrated book, Sea Prayer. Inspired by the death of Alan Kurdi, Sea Prayer is an illustrated poem/letter/story written from a father to his son as they wait for a boat to take them on a perilous journey to safety. 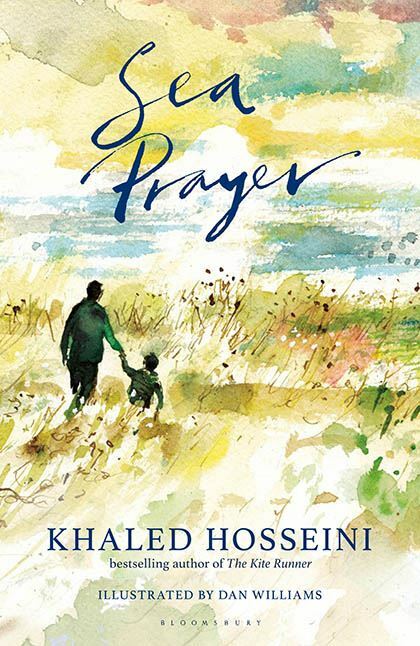 Heartbreaking and beautiful, the book remembers the bustling city of Homs before bombs, as a father prays for the sea to spare his son. Thank you for reading, and we’ll see you next week. Please contact us today at [email protected] if you would like to aid refugees, or just want to get in touch. We rely on private donations for everything we do and need your help, however small. This site also allows you to set up your own fundraising page or event for us.